The most acclaimed player at the first NCAA regional hosted by Cal Poly will not take the field this weekend in San Luis Obispo. The 2010 Mr. 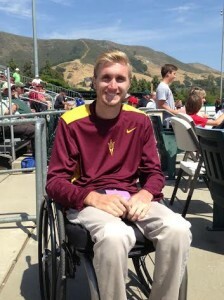 Baseball California, Cory Hahn, is a graduated senior at Arizona State whom professional clubs have twice selected in the Major League Baseball draft. But, Hahn is relegated to watching the regional this weekend from a wheelchair. Hahn’s career as a baseball player ended in his third collegiate game at Arizona State. The star center fielder suffered a paralyzing spinal injury when he dove into second base and his head collided with an opposing player’s knee. Doctors told Hahn he would never return to school. But, Hahn graduated Arizona State in four years. Doctors told Hahn he would never drive again. He now drives back and forth between California and Arizona. Of course, doctors told Hahn he would never walk again. Hahn credits his recovery to his upbringing and his experience as a baseball player. Hahn is currently a student coach with Arizona State, and his college career will conclude when the Sun Devils complete tournament play. Despite his injury, Hahn’s Major League Baseball career is just about to begin. Last year, the Arizona Diamondback selected the former prep sensation in the 34th round of the MLB draft. The selection commemorated the jersey number 34 that Hahn wore as a player. But, the pick was not just ceremonial. The Diamondbacks will employ Hahn in their scouting department. He will perform both office duties and scouting at amateur games, Hahn said. In that sense, this weekend is a preview of things to come for the 22-year-old. Multiple Arizona State pitchers figure to hear their names called names early in the 2015 MLB draft. Hahn has scouting reports on each of them. “He’s effectively wild,” Hahn said of Arizona State closer Ryan Burr. Burr throws very hard, nearly 100 mph, but the knock on him is control problems. Hahn, a left hander who starred in high school as pitcher as well as a hitter, has his eye on several left handed pitching prospects in San Luis Obispo. Both Cal Poly ace Matt Imhof and Pepperdine two-way star Aaron Brown will go in the early rounds of this year’s draft, which will take place next week. Arizona State sophomores Brett Lilek and Ryan Kellogg, are draft eligible next year like Burr. Lilek took the mound to start the regional Friday afternoon, but the hard-throwing lefty suffered an injury in the first inning and had to leave the game.